Sister Betty is back and she brought the crew with her and Crossing Over Sanctuary Temple better watch out!!!!! Reverend Leotis Tom is the fearless leader of this bunch and it is hard enough to struggle with the likes of Mother Sasha Pray Onn, Mother Bea Blister and Trustee Freddie Noel but then to also have to deal with the Cheater Brothers who are trying to take over the mortgage of their new property The Promised Land they are fighting to keep! Reverend Tom is trying his hardest to live right and encourage his members to do the same but when you have stubborn elderly members who are set in their way and feel that their way is the best way, you have your plate overfilled!!!!!! Good luck Reverend Tom and the rest of the world!!!! Pat G’Orge-Walker has these characters so on point that I am looking from church to church to find this crew because there is NEVER dull moment with them around!!!!! I commend Pat for giving us such a fun and enlightening story that you can laugh with but will also learn from!!!!! Great job Pat, looking forward to seeing more of these characters! 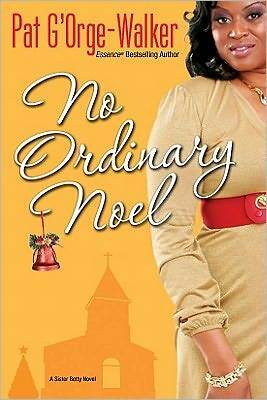 You can purchase No Ordinary Noel through Amazon.com (paperback), BN.com (paperback), Black Expressions.com and the publisher’s website: http://www.kensingtonbooks.com/.